Reservation Booking QR Code for Magento 2 is an add-on of Magento 2 Rental Appointment Hotel Event Booking & Reservation that introduces QR Code functionality in the website. Quick Response Code(QR-Code) is a barcode in matrix form, which can be seen in the orders section. The QR-code her can be used by the event organizer to recognize the person at the time of event entry. That is the authentication of the event attendees can be conducted. Thus, this will save the time of the event organizer or admin as now they need not enter any special order id or any other special details about the order. Here, the QR-code will be generated here only when the admin has generated the invoice. Quick and easy authentication of event attendees by scanning the QR-Code. Security to the event ticket owner as compared to other forms of authentication like order id, unique ids, and other such codes. The module, for now, works only for Event Products. The QR code is attached to the ticket page which will be visible once the invoice is generated by the admin. The admin and customer can download a ticket in PDF format. The customer can send a ticket to his registered email id. Admin can send a ticket to customer’s registered email id. Customer will get a zip folder and they have to extract the contents of this zip folder on their system. The extracted folder has an src folder, inside the src folder you have the app folder. Now, you need to transfer this app folder into the Magento2 root directory on the server as shown below. So, After running the commands, you have to flush the cache from the Magento admin panel by navigating through->System->Cache management as shown below. The customer can purchase the event ticket from the website frontend in Magento 2 Rental Appointment Hotel Event Booking & Reservation add-on. Hence, for this, the customer needs to click on Buy Ticket under Event booking product. This will add the product to the cart and the customer can checkout with the selected product in regular format. Once the customer places the order it will be visible to the admin in Advanced Booking System-> View Bookings Orders. Here, the admin can generate invoice of the order and set the status of the order as complete in order to enable the QR-code for the order. Remember- The QR-Code will be visible for only those orders which are having order status as ‘complete‘. 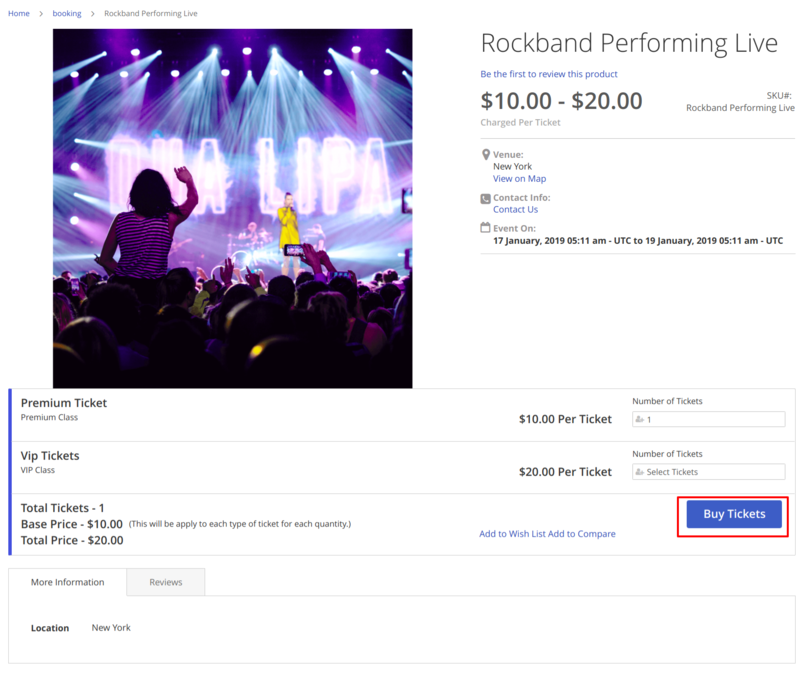 The admin can even share Ticket details with the customer on mail by clicking on Email Ticket and generate the PDF for the ticket by clicking on Download PDF. The admin can scan this QR-Code and get the details verified. Note: One cannot reuse the QR code again if scanned once. The QR code is used by the customer in the event for the verification process. 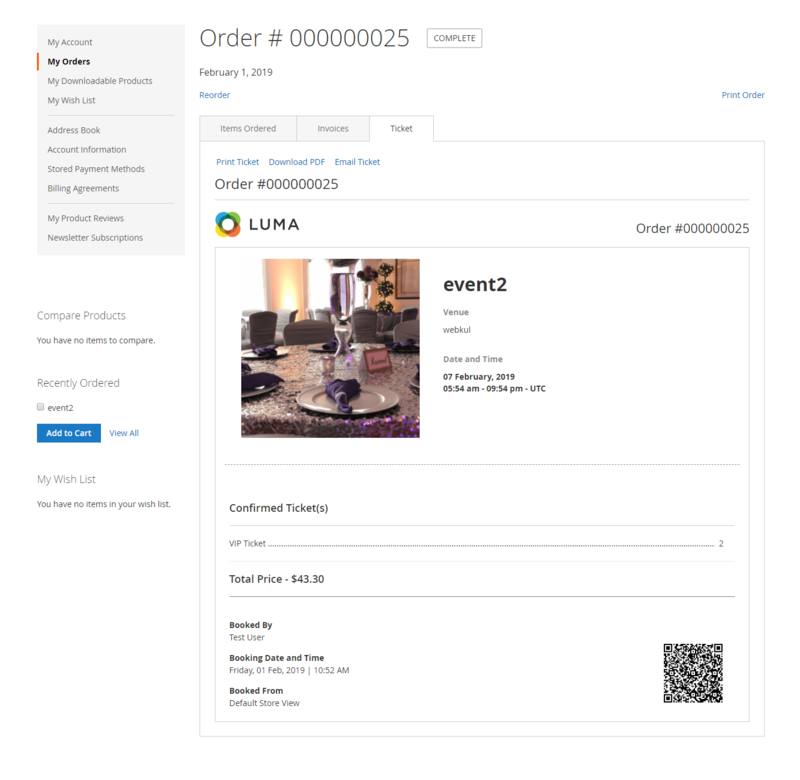 The customer can see the order QR- Code in the My Orders>Tickets. Mail ticket by clicking Email Ticket. By scanning the below QR-Code the event organizer or admin can verify the customer. Scanning QR from admin end will not change the ticket status to ‘Used’. The status will change only if scanned from the customer’s end. After scanning the QR code, URL gets encrypted for security purpose.